Manitoulin Island has a very unique ecological environment. Not only does it offer stunning views, rolling green landscapes, and a rich wildlife population - it is recognized around the world for these special aspects of nature; studied by researchers far and wide and admired by all. Read about some of these natural phenomenons below! Thumbnail image: Shirley Twinsys Photography Inc.
Manitoulin is globally recognized for its rare alvar vegetation, which only appear in select parts of the world. Alvars are a biological environment where vegetation is able to grow in the crevices of limestone planes, through seasons of both flooding and drought. These fissures appear in the soft limestone due to the dissolution in water. There are several different alvar habitat types across Ontario, varying in vegetation coverage, soil depth, and species growth. A 1992 research article outlined that ecologists studied 4 different alvar ecosystems in Ontario. 3 of them were a part of Manitoulin - La Cloche, Burnt Island, and Misery Bay. They noted that the Misery Bay rock planes were different in that the vegetation was restricted to surface cracks in the limestone. Burnt Island boasts a large alvar environment, sprawling across rock flats, woodlands, and shrub lands. The Niagara Escarpment is a beautiful rock formation that began to develop 450 million years ago. The area used to be a shallow ancient sea, and over time sediment settled and eventually compressed, forming layers of shale and limestone. These layers tell an expansive story of evolution - the oldest consist of primitive fossils, including shellfish and corals. By the time the dinosaurs were roaming the Earth, the seas disappeared and the rock began to erode - due to many years of weathering, glaciers, and water flow. This caused the softer rock underneath the more resilient limestone to retreat, leaving us with distinguishable jutting-out cliffs. The Niagara Escarpment is recognized as a part of the World Biosphere Reserve, which according to their website “promotes solutions reconciling the conservation of biodiversity with its sustainable use.” Some of Canada’s oldest trees reside within the Escarpment, which provide shelter for the 300+ bird species, 54 different mammals, and 32 reptile types. 725 km of the Escarpment runs through Ontario, including Manitoulin - the Cup and Saucer trail is recognized for it’s stunning views and 230 ft overlooks. The North Channel stretches over 100 nautical miles, and is bordered by Georgian Bay on the east and St. Mary’s River in Sault St. Marie on the west. It’s around 20 nm wide, but greatly narrows at points. It reaches 30 ft deep, but the depth of the channel changes throughout. The variance in depth allows for great anchorage spots, although there are several marinas to stop at along the way. The North Channel waterway meets two bridges: the Little Current Swing Bridge and the Bernt Gilbertson Bridge at St. Joseph’s Island (on the west end of the channel). 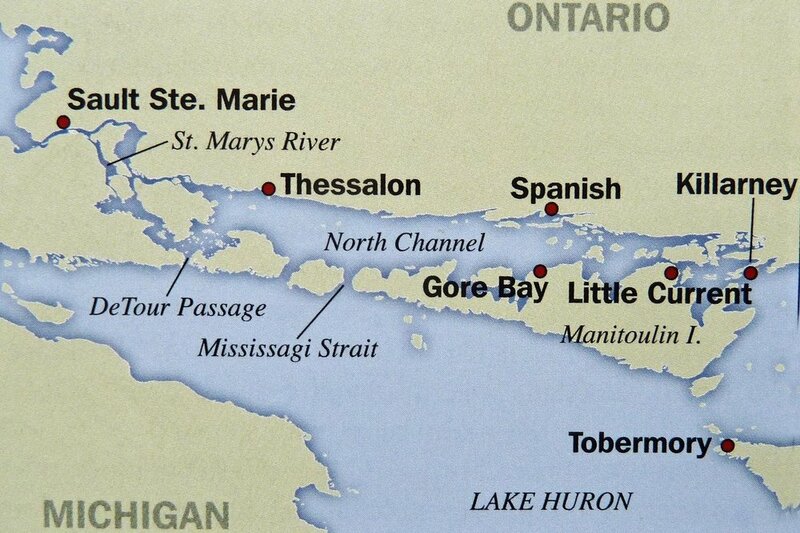 Two small channels connect the body of water with the rest of Lake Huron - the False Detour Channel and the Mississagi Strait. People enjoy travelling the North Channel because the forested surroundings and smattering of smaller islands offer a peaceful journey, such as the scenic Benjamin Islands - which are about 30km from the shores of Little Current. Misery Bay was classified as a provincial park in 1989, but it has been deemed an important environmental area since 1974. It is the only “operating” provincial park on the Island, meaning there are facilities and services provided - depending on the time of year - as opposed to the latter two parks. It is located 35 km west of Gore Bay. There are several different trails to hike along, totalling about 16km, and ranging from woodland strolls to beach coastline views. Misery Bay is especially recognized for its rare alvar population, which we discussed earlier, but it also has ecologically notable wetlands; hosting many unique creatures and plants. Many types of birds can be found at Misery Bay, such as warblers, Eastern Kingbids, Bald Eagles and Sandhill Cranes. 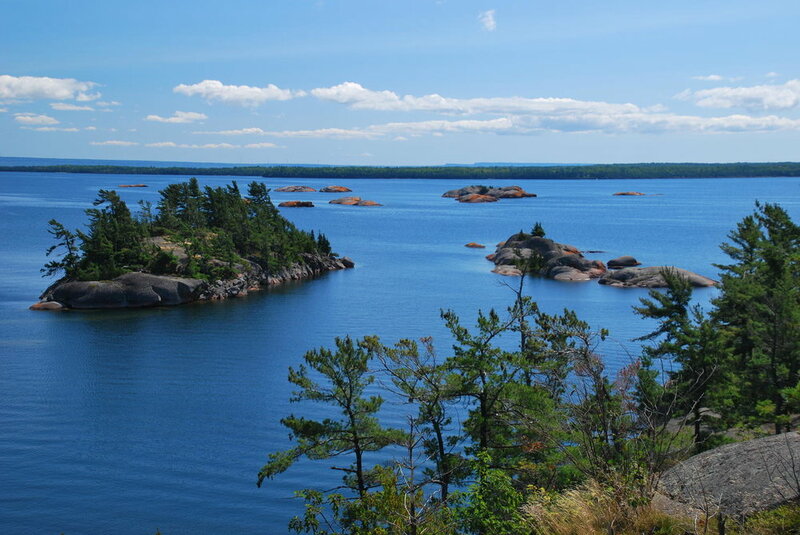 Located directly east of Manitoulin, Strawberry Island was designated as a provincial park back in 2014, and recommended as a “nature reserve class park,” meaning the primary aim is to protect the natural habitat and utilize the educational benefits. Strawberry Island is 1,145 hectares, and houses incredible alvar habitats as well as wetlands. The island is prominently known for its Combined Lighthouse and Dwelling, a Federal Heritage Building that has major historical value and current recreational boating usage.